When was the last time you looked in your jewellery box to see what lay inside? While you are sure to have your favourite pieces, the “go to” necklaces and bracelets for special events, there are bound to be accessories you no longer wear. In fact, some of your gold jewellery may even be in a state of disrepair. Rather than let it sit there for years on end – of no value to anyone, why not turn it back into cold hard cash? Believe it or not, your old and broken gold bracelet that’s currently worthless in its fragmented form could be worth a significant amount of money as scrap gold. Scrap gold is anything you own that’s made out of gold and no longer serves its purpose in its current form. From broken jewellery and coins through to dental scraps and watches, anything made from gold can be suitable to on-sell for material value. However, what isn’t scrap gold are items such as plated or costume jewellery. These usually are mixes of other metals to make up the structural components and have very little value. What is Scrap Gold Used For? You may wonder why someone would want to buy your great grandmother’s old broken watch or your bracelet with the broken clasp. While it’s no longer suitable for you because you can’t wear it, that doesn’t mean it can’t serve another purpose. Scrap gold buyers don’t buy your gold so they can on-sell your broken bracelet. Instead, they buy it for its material value. Gold is recyclable. It can be melted down and turned into something that’s as useful as what your jewellery used to be. There is a finite supply of gold in the world. While no one knows for sure how much there is left, there isn’t an endless supply to extract. What’s more, the excavation process can have a detrimental impact on the environment. The more gold we can reuse for new items, the better it is for the earth. What’s more, your previously broken gold jewellery now has a new purpose in life, either as a new piece of jewellery or as part of an electronic device. How Much is Scrap Gold Worth? Just like petrol prices, the price of scrap gold fluctuates on a regular basis, and it’s also different from the standard price of gold. Because of the process to melt down your scrap gold into a usable form, you’ll find the rates can be dramatically different than if you were to sell a solid gold bar. What’s more, each dealer and buyer in the country will have differing buying prices as well. For a ballpark figure, if you have 10 grams of nine-carat gold, you can expect to receive around $170. How Easy is it to Sell Scrap Gold? Believe it or not, selling your scrap gold is as easy as finding it at your home, having it valued, then putting the cash in your pocket. You can go into a gold scrap dealership with your goods, or you can even sell it online. Many scrap gold dealers enable you to work out the calculations online, courier the items to them, then receive the money in your bank account. In essence, no matter how you do it, you’ll find it’s a straightforward process. 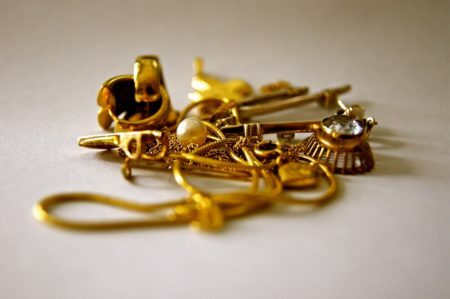 Choosing to turn your preloved gold items back into cash is not a decision many people make lightly. However, for economic reasons, wishing to cash in on scrap gold can make perfect financial sense. If you find yourself in need of quick cash, track down that old broken bracelet and get a price. You may find its worth is more than enough to satisfy your requirements.